The company says it is actively engaged with all its aircraft lessors and is regularly providing them with updates on the efforts taken to improve the liquidity. 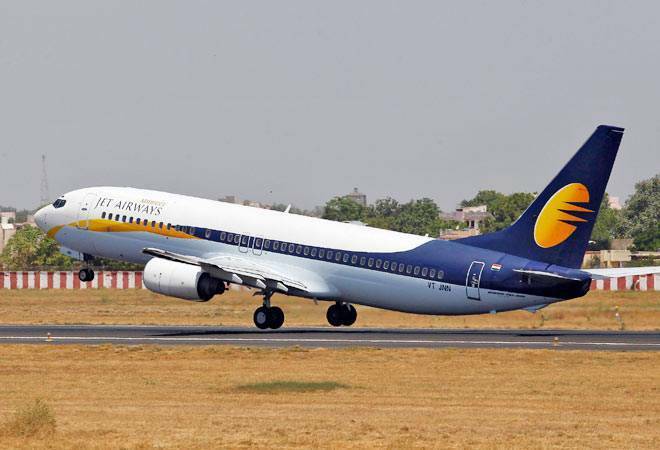 Jet Airways, on the verge of going belly-up, has suspended operations on as many as 13 more international routes till end-April even as it grounded seven more planes due to non-payment of rentals, taking the number of such aircraft to 54. Besides, the airline has also reduced frequencies on seven other overseas routes, mostly from Delhi and Mumbai, according to airline sources. "... an additional seven aircraft including two planes of JetLite, have been grounded due to non-payment of amounts outstanding to lessors under their respective lease agreements," the airline said in a filing to the stock exchanges late evening Friday. The company said that as mentioned earlier, it is actively engaged with all its aircraft lessors and is regularly providing them with updates on the efforts taken to improve the liquidity. Earlier, sources said routes where services have been temporarily withdrawn include Pune-Singapore (seven a week), which was launched with much fanfare late last December, and Pune-Abu Dhabi (seven flights a week). Besides, the airline has also suspended services on the Bangalore-Singapore route, where it flies twice daily, till April 30. The flights which have been suspended from Mumbai for this period include services to Abu Dhabi (12 weekly), Bahrain (4-7 weekly), and Dammam (14 weekly). These services will remain suspended till April 30, as per the source. Similarly, flights on the Mumbai-Hong Kong (7 weekly) route will also not be operated between March 23 and April 30, while the Kolkata-Dhaka services have also been suspended till April 30. In addition to this, services from Delhi and Mumbai to Kathmandu, Bangkok, Doha, Kuwait and Singapore have been also reduced significantly.